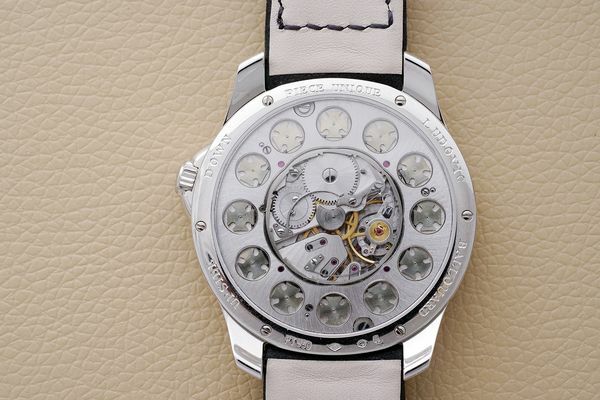 Independent watchmakers of the 21st century have gained significant renown in the past decade, and in many cases, have garnered a devoted following. This is especially true when they have been able to distinguish themselves, both in terms of design and vision. For Ludovic Ballouard, that breakthrough came with the Upside Down, a model based on a technically brilliant movement which proposed a very novel way of showing the time. 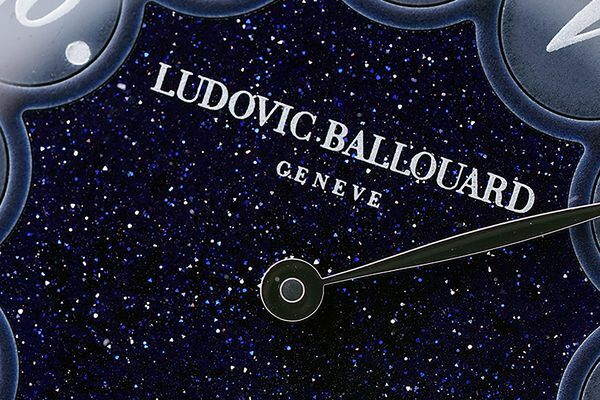 Ballouard released the 'Upside Down' in 2015 as a limited series of twelve watches cased in red gold and twelve in platinum. 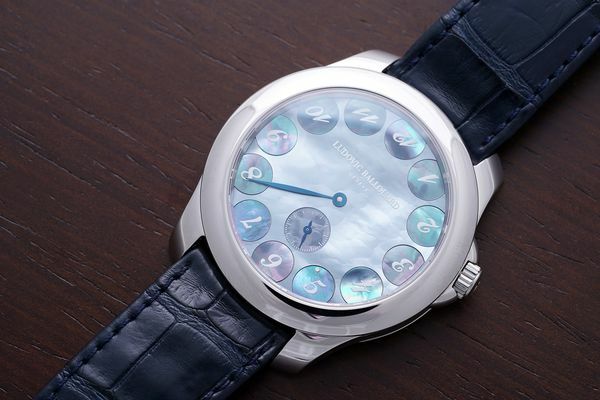 Originally presented with unique mother-of-pearl marquetry radiating from the center - last year, Phillips sold one of his early models for CHF 47,000 - the Upside Down went on to house semi-precious stones and other natural elements as dials. 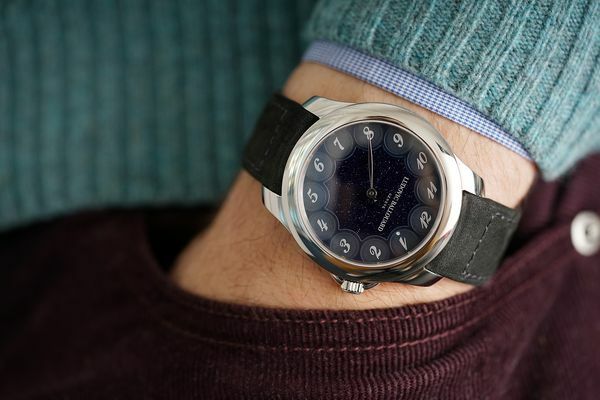 In the present iteration (pictured below), Ballouard takes up the aventurine dial, also known as goldstone, that has gained popularity in watchmaking in the past few years. Aventurine is, contrary to both its names, not a stone at all but a special glass that was created “by chance” in the glassmaking workshops of Murano, Venice – hence the Italian name “avventurino” taken from “aventura”, the Italian world for adventure or chance . This story is partially apocryphal, as research also shows that the Ancient Egyptians but it has a basis in fact, and the earliest known mention of this glass is from the early seventeenth century. Some historians assert that the Miotti family of glassmakers held the secret of making aventurine until the end of the 1700s, until it faded from prominence for about fifty years until suddenly experiencing a sudden resurgence in popularity. Copper is used to create the golden flecks in most aventurine glass; though the blue color found in Ballouard’s Upside Down is a result of the use of cobalt instead of copper. 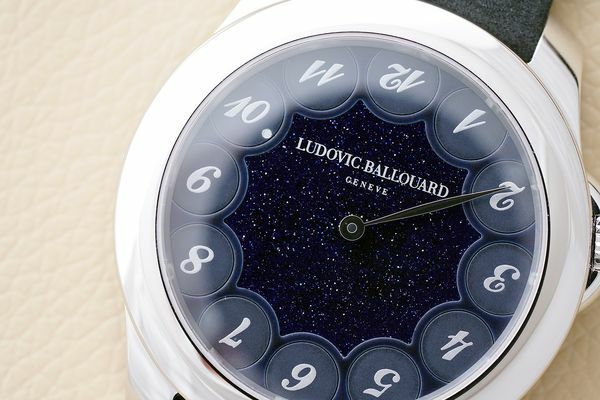 The resplendent golden flakes are suspended in what seems like an expanse of deep blue, and though the dial itself is only 0.5mm thick, there is an unmistakable depth to the dial. While the complication itself provokes joy, the dial induces contemplation and serenity. The overall effect is simple yet profound – with no unnecessary ornamentations, aesthetics and mechanics exist in harmony. But this is not just a pretty watch. It's also deceptively clever in what it chooses to show and when it shows it. Because, if you haven't already noticed, those hours on the dial aren't all facing the right way up. Only one does, and only for 60 minutes at a time. 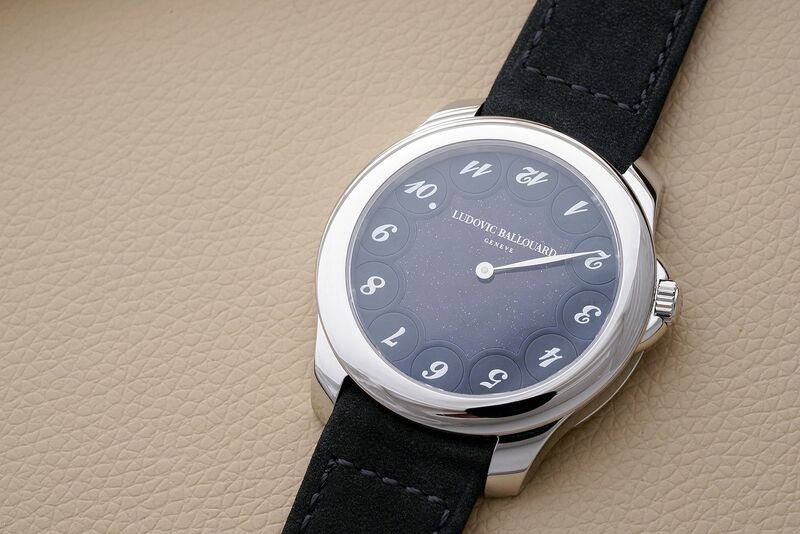 As in the other 'Upside Down' watches, the numerals are each set on their own, independently mobile disc with a simple dot to indicate the hour. When the minute hand precisely reaches the fifty-ninth second of the fifty-ninth minute of the hour, the past hour number instantaneously turns 180 degrees upside down. Simultaneously, the new hour turns right side up. Here is what it looks like, on the Upside Down sold last year. Looking at the dial at 5 o'clock: a small portion of each disc is hidden. Then, when it is flipped, it reveals a subtle white dot to make it easier for the wearer to quickly find the correct hour. 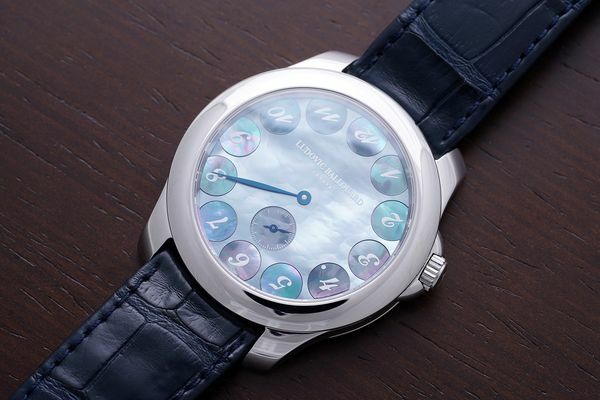 Meanwhile, a delicately curved blued-steel feuille hand indicates the minutes, and there is a small seconds hand with a delicate outer tract rendered in white, also in a separate mother-of-pearl disc. "The idea came to me during the economic crisis of 2008," said Ballouard during a recent interview with Phillips. "The media was always talking about numbers, on the television, on the radio, in newspapers, and I thought...who cares about these numbers? Life goes on! And with watches, it's the same really. You have eleven numbers on the dial that are useless while only one tells you what you need to know." It's certainly my most well-known piece...it represents my philosophy perfectly. The entire movement is beautifully finished, with a sunray brushed gilt brass movement with contrasting brushed steel Maltese crosses, each one positioned underneath its corresponding hour disk. The upside down complication is made possible by a take on a more well-known complication — jumping hours. It would have been far simpler to assemble the mechanism to power these rotating discs directly underneath the dial; in defiance of the easy route, Ballouard believed that the owner would appreciate seeing the complexity of the complication and watching the discs rotate (quite correctly), so he placed the mechanism on the reverse, visible through the sapphire caseback. This is achieved by boring minute holes through the movement plate to the corresponding pinions that control the hour discs. To complete this pairing of technical prowess, playful design and evocative elegance, the movement and dial are contained in a 41mm platinum case. The case exhibits a broad, convex bezel with thick yet elegant short lugs and the crown characteristically placed between two and three o'clock. "It's certainly my most well-known piece and the one that I present when I introduce my company because it represents my philosophy perfectly," said Ballouard. "I like the fact that people don't necessarily get it right away. It's a subtle piece, but people have a huge smile on their face when they see how it works, and what more can I ask for?"